Recurring Tasks means is to create a series of identical task with with recurring due dates. For example, you might define the weekly meeting as a recurring task for some account. Before Spring’14 release you were not able to do this through Salesforce UI, so the alternative way is “How to create a Recurring Event or Task with Data Loader“. In Spring’14 release Salesforce has added an awesome feature “repeat tasks” after that you will be able to create recurring tasks on a flexible schedule. Salesforce has added two new fields called as “Repeat This Task” with Data Type- Picklist and “Recurrence Interval” with Data Type – Number. 1) “Repeat This Task” picklist have only three values and you can’t add or remove values from this picklist. The next task in the series is created only when the current task is due or marked completed. 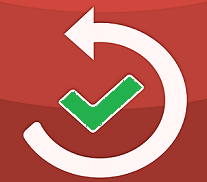 Repeating tasks are a streamline alternative to regularly recurring tasks when you don’t need to get a task done on a specific day. Note:- If “Repeat This Task” on an existing task is set to (Task closed), it indicates the task was closed as part of a repeating series. 2) “Recurrence Interval” enter the number of days after the task’s due date or completed date when you want the next task to be due. 1) Click on Name | Setup | App Setup | Customize | Activities| Task Page layout. 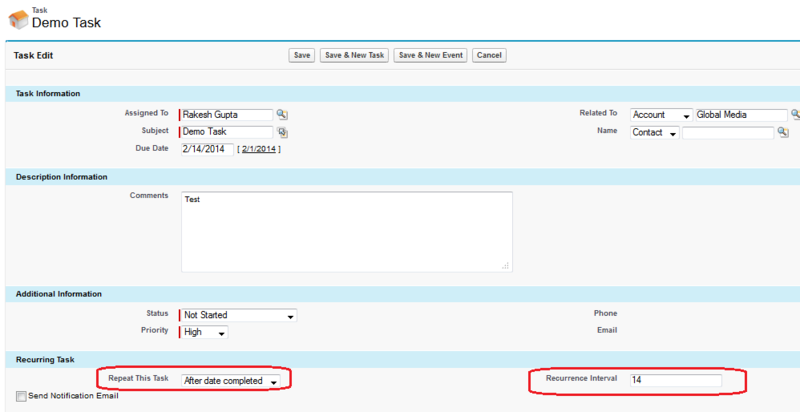 2) Create a new section called as “Recurring Task“, then drag and drop both fields on task page layout. 1) To test this feature go to any Account records detail page and navigate to “Open Activities” related list, Click on “New Task” Button and fill the details shown as in below snapshot. 3) Close the task that you created in last steps. 4) Now you can see, One new task is automatically created with the same name. Note:- If a task is set to repeat after the due date, and the date you close the task precedes the due date by more than the recurrence interval, then the due date of the next task is set to a date the same as or later than the current task’s due date. For example, if you set a task to repeat three days after its due date, but you close the task five days before the due date, the due date of the next task is set to one day after the current task’s due date (due date minus five plus twice the three-day interval). How can you distinguish repeating tasks from other tasks. If “Repeat This Task” on an existing task is set to (Task closed), it indicates the task was closed as part of a repeating series. You can use this information to distinguish repeating tasks from other tasks for reporting purposes. To check this Go to Account details page that you used for last steps and navigate to “Activity History” related list and open “Demo Task” that you closed in the last steps.